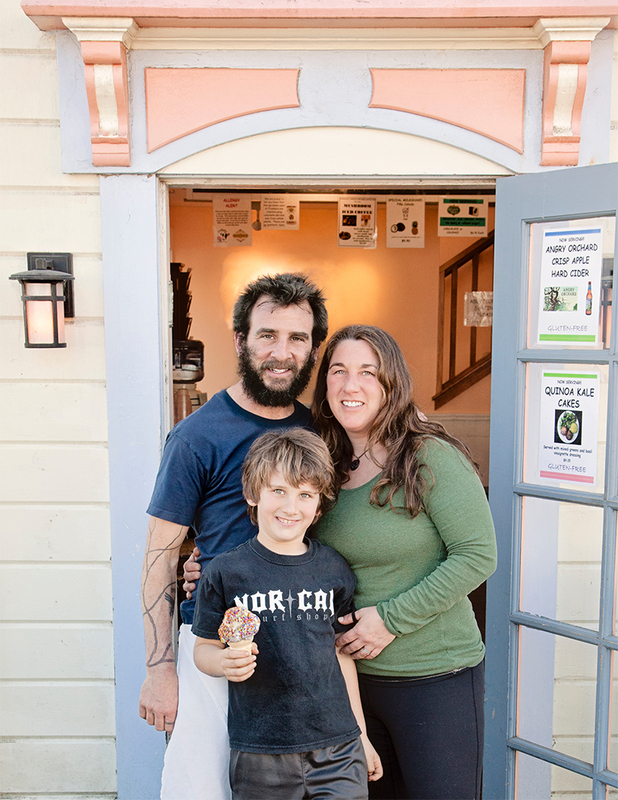 We like to think of Frankie’s as holistically and quintessentially Mendocino – friendly, organic and comfortable. In a picturesque town brimming with fabulous art and high-end cuisine, we offer locals and visitors a place to kick back and be themselves while feasting on yummy eats and treats. To fully get Frankie’s it helps to know a little about us: Ruth (the Long Island girl), S.A. (the Detroit boy) and our son Yoel, (born at home in Little River, CA). When we first met back in 1994, we were in Israel on a volunteer program, learning the language and doing community service projects. Although there were many memorable and poignant moments during our year there, we actually spent a lot of time searching out the perfect falafel. Which place had the best salads, the right consistency of the falafel, the tastiest tahini, etc. We were then, and are still foodies. After coming back to the states, we lived in San Francisco and pursued other passions. For Ruth, that meant working at the SPCA and for S.A., cultivating his green thumb gardening with kids. In 1997 we moved up to Mendocino and were able to continue working in these fields. Over the years, we talked about having an eatery/venue in the village that would encompass the things we loved and bring our community together: a gathering place that served organic food, casual enough to hang with or without kids in a comfortable artistic environment. In our planning we discussed everything from how to serve the best pizza and falafel to how we could operate with minimal waste and healthy products. Then in August 2007, we took the leap and bought Frankie’s from the founding owner Mary Muto. How grateful we are that she opened Frankie’s which has grown to be a locals’ favorite, as well as a place where tourists return year after year. Building on what Mary created, we’ve taken the original ice cream and pizza parlor to the next level. The menu has and continues to expand while we search out local products and the highest quality organic ingredients. When dining in, your meal is served using glass, ceramic and with metal silverware instruments. Much of our ‘to go’ packaging is 100% biodegradable and compostable. From non-toxic cleaning products, to LED lighting, to offering a comfy local gathering place, we strive to create a space that is as earth and community conscious as possible. That means we are committed to using products and ingredients that are in harmony with peoples’ and the planet’s health – products that you can feel good about eating and using. So come enjoy and stay a while – nosh and kibbitz. Frankie’s continues to evolve, so if you are in the neighborhood please drop by and say hello. 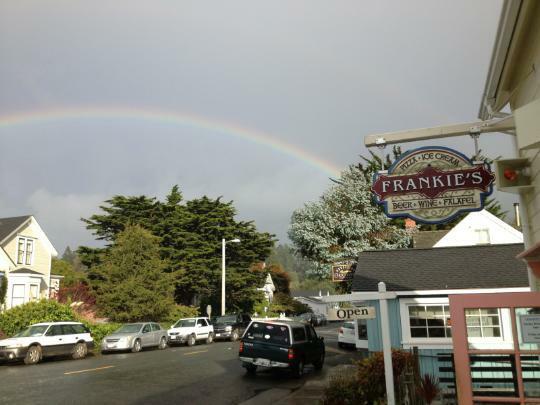 Frankie’s in the village of Mendocino is the ideal place to pick up a quick nosh or to spend time savoring food, visiting with friends and neighbors. We are family owned and run, serving pizza, falafel and locally made ice cream as well as other items from our own kitchen. Enjoy espresso drinks, tea, beer or wine.